When I threw the fist-sized rock in my hand at the Bolivian man’s car door, his eyes opened wide, forcing salt-and-pepper brows, like fat caterpillars, to scurry up and be eaten into the creases of his forehead. Clearly this was more surprising to him than what prompted his first response to me, spat out in Spanish after he caused me to hit the ditch: Why are you riding this big motorcycle? You’re a woman! It was April 1, 2016, a Fool’s Day indeed. 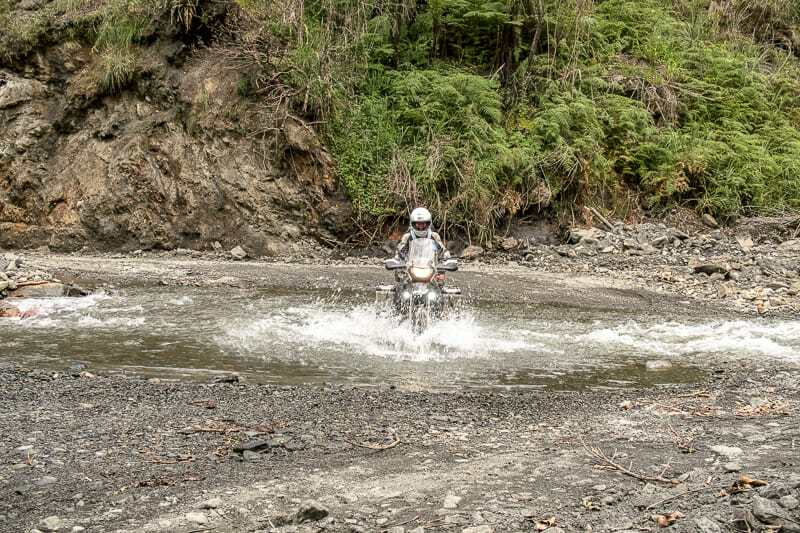 Dave and I had left Corico and were riding to La Paz, but we’d decided to take some back roads along the way. 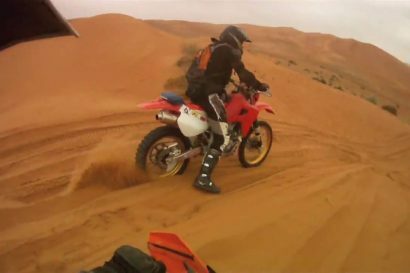 We were over 3 months into our 2-year round-the-world trip and I had yet to master riding a motorcycle in mud. 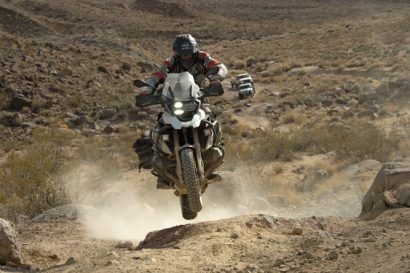 I’d dropped my G650GS five times already in a 30-mile stretch and was at the end of my rope when I came around the corner to meet my sexist señor, straddling the mucky road like there couldn’t possibly be anyone else using it. 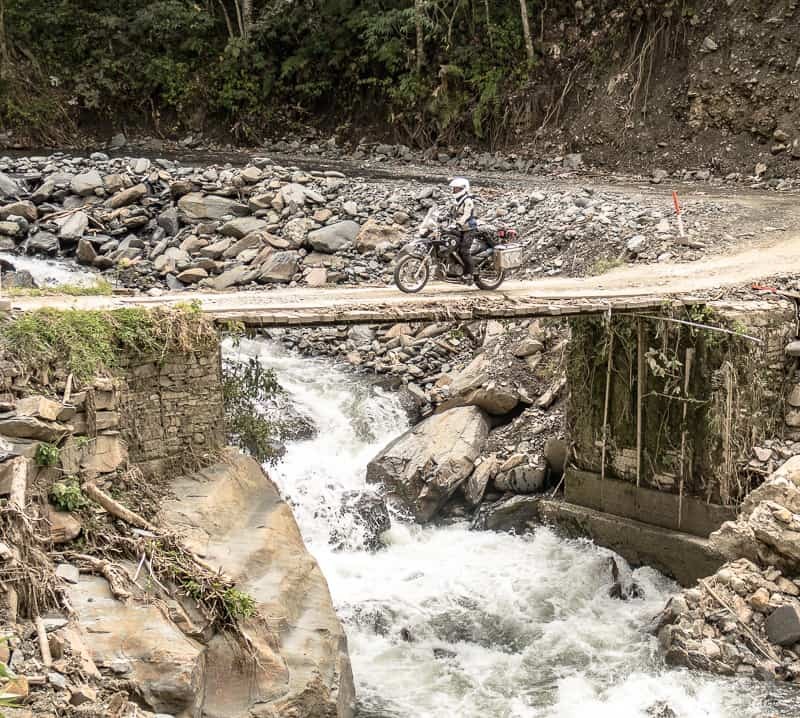 Dave and I were getting used to events like this while riding through Latin America, though it wasn’t getting any easier to surrender to these heart-stopping moments. After doing a quick body check I pushed out from under my bike. The man and I stared at each other. He was unforthcoming of any help and this pissed me off. He’d just watched me lose control of a motorcycle and hit the ditch but couldn’t be bothered to get out of his car and see if I was OK or help me pick up the bike. He just continued to scowl at me, appearing more upset by my radical feminist behaviour than the small ding I’d put in his car door from throwing the rock, (which only added to a collection of others). I didn’t want to be angry. I wanted to travel the world by motorcycle waving to smiling faces, learning about various cultures and accepting invitations into people’s homes—not throwing rocks at cars after a near head-on. But for several weeks now it seemed Dave and I spent most of our days avoiding death by motorcycle. Nerves were fried. A few days before my ditch episode, Dave had also narrowly avoided a head-on collision. In this case it was with a Peruvian transport truck on a stretch between Nazca and Cuzco. The truck was pulling a trailer and taking a corner too fast, swerving over the double solid line into Dave’s lane. After this incident, Dave stopped to catch his breath. I pulled over to ask what happened. He’d been riding ahead so I hadn’t seen everything. Dave had watched the truck and trailer unit swerving from side to side coming at him. As he went to move off onto the shoulder, so did the truck, as though he never even saw a bike at all. 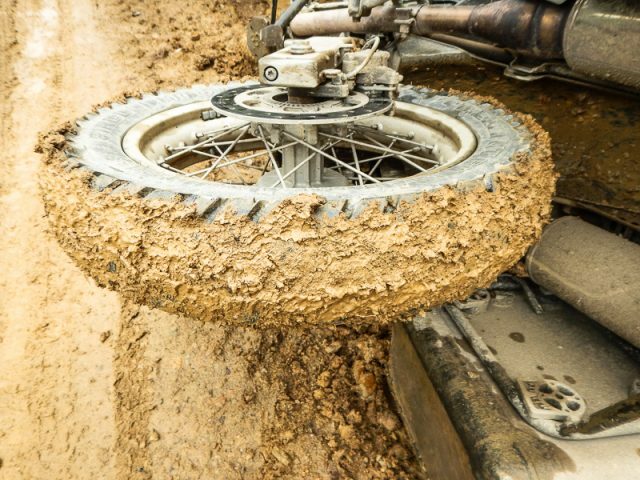 Dave had only a few seconds to line up an escape route and hop himself off the highway going about 55 mph into grass and dirt, while each one of the truck’s driver side tires whizzed past within inches of Dave’s panniers. 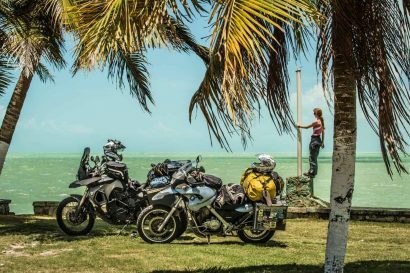 After events like these we sort of wondered about our decision to take 2 years to ride over 60,000 miles around the world on two motorcycles after selling everything we owned: my business, Dave’s house, two vehicles, and anything else that didn’t directly benefit our goal. Getting run off the road wasn’t the only thing we had to fear. Dogs were a major contributor to road obstacles. Canines would chase our bikes, but we figured that although they were aggressive, they were surely not stupid enough to launch at motorcycles. One evening, Dave and I were traveling along a dirt road in a remote area of northern Peru, searching for a place to set up camp. The view was wide as far as the eye could see and sparsely populated with a half-dozen camouflaged, earth-toned homesteads, almost invisible from the road. To my left the terrain sloped steeply to a mountainous backdrop. A little farm sat at the base. The road cut through the declining terrain, creating an abrupt eroded edge about 7 metres high off the road. I was following about 30 metres behind Dave’s bike. Out of the corner of my left eye, I saw a black dog barrelling down the slope toward us. He was mid-sized, maybe a Rottweiler. His eyes were set on Dave. Mine were focused on the road. The dog would come to a screeching halt of dust and fur before the cliff edge, right? Although Dave had passed by and was now out of attack range, the dog didn’t break its pace. While I picked up my speed, closing the gap, I saw this insane beast launch Superman-style high over my head. I didn’t look back to see what a dog who’s just hucked 7 metres onto a flat landing looked like. Broken legs at least. Somehow we’d caused this animal a lot of anxiety when it was likely just being protective of its environs. Although I certainly felt lucky not to have been tackled in the head by a Rottie, it also made me feel awful. Like the time I ran over a baby pig. Leaving a small town where we’d spent the night, again in northern Peru, Dave and I were coasting through an adjoining village when we startled a bundle of piglets on the road. One spooked and did an unexpected left turn straight into my front tire. A baby pig is not as small as you might think. The 650 bucked and swerved while I tried to keep it on course to the tune of baby pig squeals. It got stuck in my skid plate and dragged for a few metres before the final blow of my back tire finished him off. Again I couldn’t look. Not only to avoid imprinting the damage of yet another animal into my brain, but also because if the farmer was nearby I’d likely get into a lengthy discussion of what was fair payback for hitting one of his food sources. My guilt lasted all day. When we weren’t dodging oncoming vehicles or slaughtering local fauna, we could be found festering in the traffic mirage of a Latin American super city, like Lima. Home to over 10 million people squeezed into 1,031.8 square miles, Lima’s density is roughly 11,000 people per square mile, compared to, say, Los Angeles—where people complain avidly about traffic—at a mere 550 people per square mile. Traffic in Lima is so terrible that during certain hours, traffic lights are replaced with an incredibly brave policeperson standing in the intersection directing the flow of commuters with nothing but a shrill whistle and a pair of hands clad in white gloves. It was around 8:00 p.m. on a sweaty Thursday night when Dave and I rolled straight into this chaos. 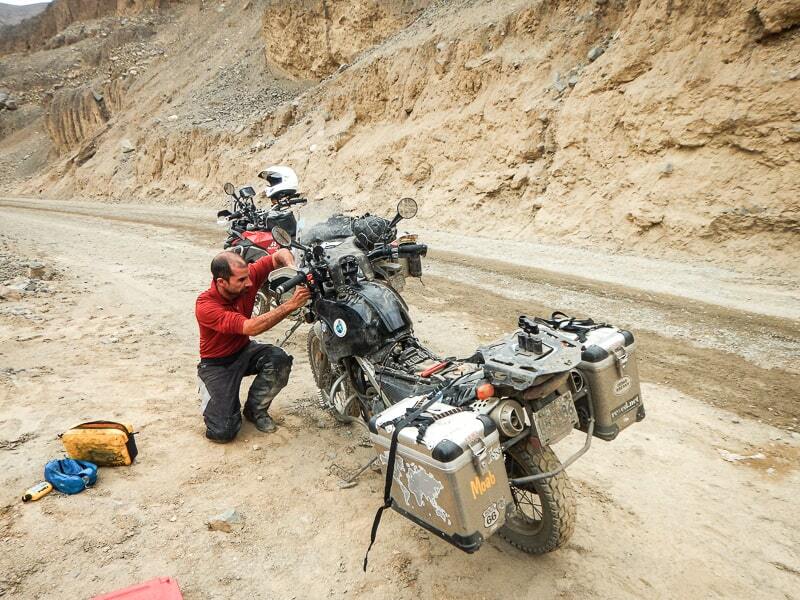 We’d had a late but relatively short day riding 250 miles from Huaraz. 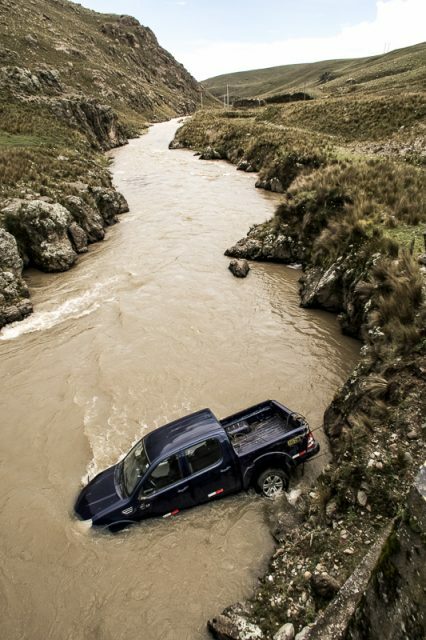 Some time in the afternoon was wasted watching a pickup truck being pulled out of a river. The driver had swerved to miss a pile of cows lounging on the highway. Our GPS showed only 8 miles remained between us and our pre-determined hostel. We were looking forward to cold everything: beer, showers and maybe even air con. However, we wouldn’t get there for another 3 hours. While waiting at a white-gloved traffic light, my 650 started to overheat. I hopped it onto the sidewalk beside a cart selling salted corn-on-the-cob and watched while Dave did the same with a look of utter exasperation. We’d recently spent a night on the side of the road in Cañon del Pato after finding a small rock had wedged itself between my rad and frame, causing a hole and leaking coolant. The Epoxy patch wasn’t holding up. I turned off my bike. We watched several episodes of traffic lights go from green to yellow to red. The red car we’d been behind moved half a block. After 10 minutes I started the bike and eyed up some road vacancy. Just as I put the bike into gear to hop off the curb, the traffic suddenly started moving. These people had been waiting for almost a half hour to get a turn through the intersection. No one was doing anyone any favours. I jerked on the brakes to avoid riding into the side of a car door, lost my balance and toppled over. My bike now lay half on, half off the road. I’d narrowly missed the corn-seller. We quickly heaved the bike back onto its rubber and forced our way into traffic only to come face-to-face with a white-gloved palm. At some point, we got moving again, which was good, but we were highly impatient now to get off the streets and park ourselves and the bikes for a rest. Dave had had enough of everything by this point so when another pile-up of cars came into view, he split the lanes and nosed his way into the intersection only to be promptly hit by a taxi. The force wasn’t hard enough to come off his bike but it did cause the taxi’s headlight to cave in. At home, this would mean pulling over, getting insurance information, maybe even calling a cop over if one was nearby. Here in Lima, the driver just kept driving once Dave was out of the way. 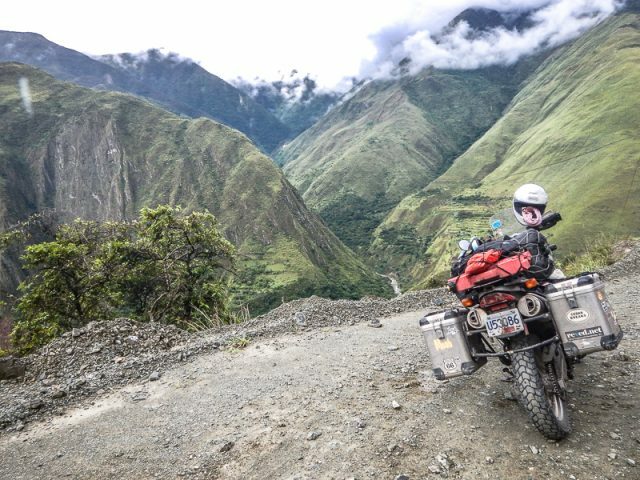 Now into the 21st month of our 2-year trip, having ridden over 45,000 miles through 29 countries, we still recall road time in Peru and Bolivia as being among the more frightening (although some countries in eastern Africa are a close second and we haven’t traveled across Russia yet). But I have to say we found this part of the world achingly beautiful. 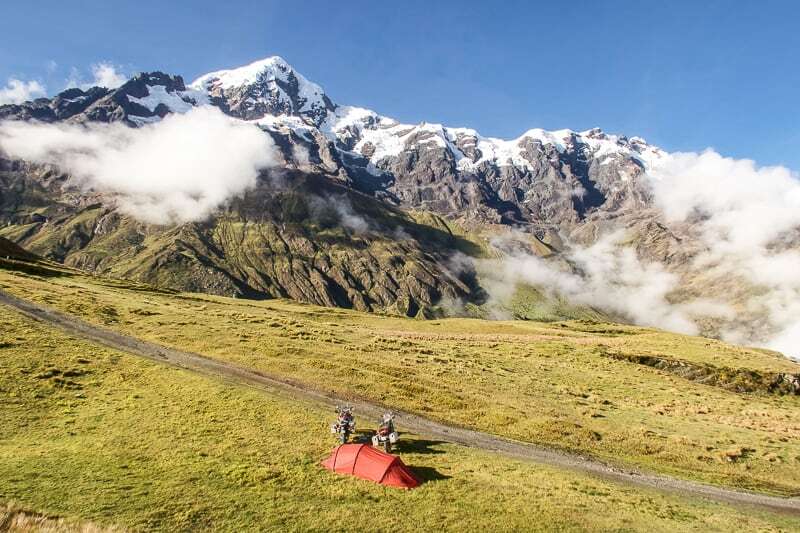 The Andes are incredible, especially when you can ride through and over them at altitudes upwards of 5,000 metres. 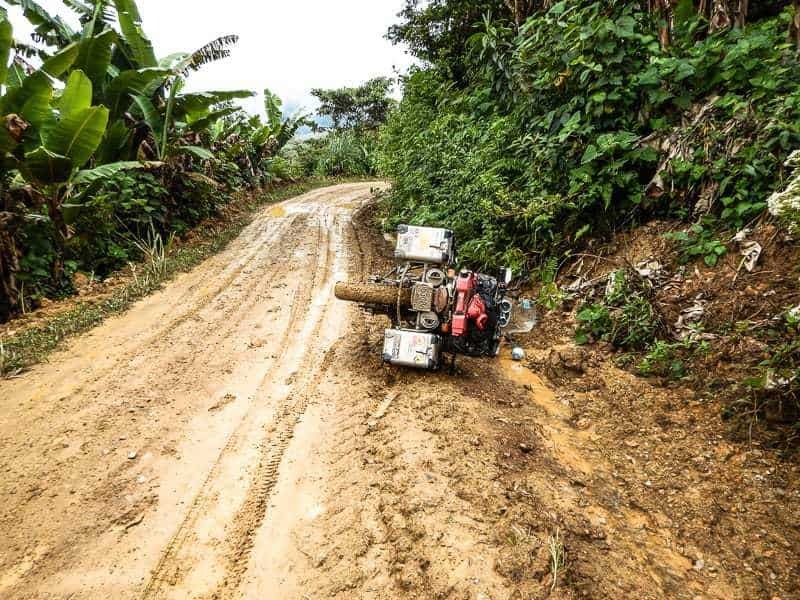 Peru and Bolivia have some of the coolest, albeit most dangerous roads in the world. 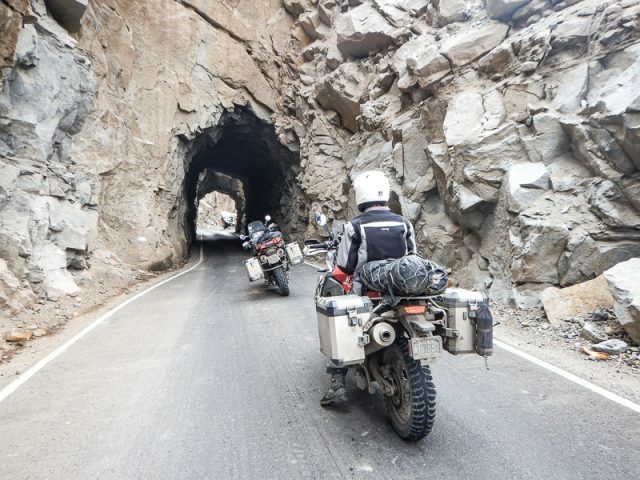 The amount of geographical relief can be up to 3,500 metres and riding a motorcycle here is both terrifying and exhilarating. 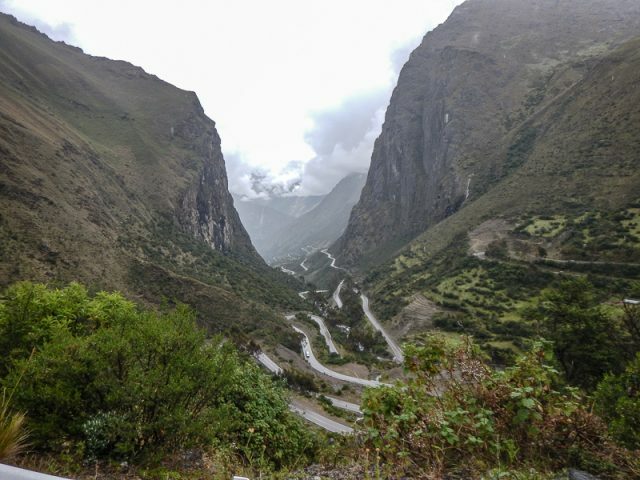 Sure, you might come around a single-lane corner with no guardrail and meet either a transport truck or a splatter of rocks in the road, but how many places in North America allow you to pass under a waterfall while driving, as we experienced along the Death Road in Bolivia? Or disappear into 1 of 42 one-way tunnels where no one actually knows who has the right of way, like traveling through the Cañon del Pato? Playing in traffic in the land of salsa and tango is not unlike the dance itself. Vehicle wheels move as fast and as frequent as the flick of a dancer’s hips, but once you get the hang of it, you’ll see flow and order.